For many years, I can recall the glowing comments and praise for Shen Yun, a presentation of Chinese dance and music that tours on a regular basis. Before my late friend Fidel Gomez, Jr.'s death he expressed if not a desire at least a curiosity about seeing a Shen Yun performance. In that spirit I decided that this year I would splurge on a ticket costing $100 including those damn service fees to see what Shen Yun was all about. What I found was a show that was interesting in spots, a bit oddball in others but that underneath its veneer of traditional Chinese music and dance harbored a semi-open agenda, one that did not sit well with me. Shen Yun has a Disney-type feel to it, something I could easily see at EPCOT's Chinese Pavilion, full of spectacle yet a bit routine and mannered. I understand that Shen Yun changes its actual dance numbers and songs every year, but for the most part as I also understand it the program itself stays pretty much the same. Broken down into a series of brief dance numbers accompanied by a mixed Asian-Western orchestra and two songs performed by a baritone and soprano, Shen Yun is overseen by a duo Master and Mistress of Ceremonies consisting of an Anglo Master of Ceremonies and an Chinese Mistress of Ceremonies. This duo serve as our guides and narrators through the various performances, with the Anglo speaking primarily English and the Asian speaking primarily Chinese (I cannot guess whether it is Mandarin or Cantonese). I say 'primarily' because on occasion each is able to speak the other language if not fluently at least respectfully. Our Master of Ceremonies, Perry Uzunoglu, and our Mistress Nancy Zhang mostly stayed within the confines of the program. They do try for some banter that falls a little flat and forced. In the dance number The Queendom, a comical male character ends up pregnant after drinking from the Lake of Fertility. Afterwards, in English if memory serves correct, Nancy asks what the moral of the story is. Perry replies, "When on a long journey, bring bottled water". Another time in the first half, Nancy and Perry try to get us to say "I love Shen Yun" in Chinese. Somehow, it's explained that 'Wo' is 'I', so Perry says, "Wo is Me". I guess that's what passes for quips. The Shen Yun dance numbers are mostly set either in Chinese history or mythology where we see a series of dances choreographed to military precision, the dancers exact in their movements. There were some quite impressive numbers. The Sleeves of the Tang Palace number had our bevy of beauties use the sleeves of their costumes as props. Porcelain in the Balance is exactly that: the women balancing porcelain jars on their heads. To its credit this dance number did allow them to hold the jars with their hands, but it's still impressive. Just as one watches figure skating to see if the skaters fall, one watches to see if the jars fall off and shatter into a million pieces. They held firm. The Charming Ladies of the Yi number had our dancers wear elaborate costumes that reminded me of the Mexican 'China Poblana', which according to legend is based on a Chinese woman who found herself in Mexico. Other numbers had a mix of comedy and acrobatics in them. Restaurant Cheer takes the Chinese restaurant theme and has laughs with it, our waiters balancing their dishware while trying to avoid the owner. The Dimwitted Monk has almost a Jackie Chan-type manner with its mix of action and comedy. For me, the clear standout was Fairies of the Clouds, where the female dancers seem to emerge from the clouds. It was a beautiful number, enhanced by their matching blue gowns. When our dancers took us into myth and the past, things went well. It is only when we are brought into the present that things take a peculiar turn. There are two 'contemporary' dance numbers: Goodness in the Face of Evil and The Final Moment. They are quite freaky and jarring for a show billed and presented as a celebration of traditional Chinese arts. Goodness in the Face of Evil involves a nice little girl innocently reading her Falun Dafa* book when the Commies come sweeping in, stealing her from her mother and blinding her. Eventually, our little girl manages to be released from prison and if memory serves correct her eyesight is restored thanks to the Divine. The Final Moment is probably more bonkers. Here, our Falun Gong practitioners are again just doing their own thing with their 'Big Yellow Books' when they are threatened. If I understand the dance number, the Communists are swallowed up by the Earth after a massive storm sweeps to metaphorically and literally clean up after Karl Marx. In the end, a deity seems to bring peace and love to the world, the same way Mr. Burns did right after he got his booster. On the giant screen where our dancers sometimes appear to leap into/out of, I am not kidding: a giant Karl Marx with rolling eyes who looks like he escaped from a Monty Python animation bit seems close to devouring everyone. Perhaps this is why Shen Yun has the strictest 'No Photography' policy I've ever seen: to stop people from marveling at such curious sights for posterity. It's standard for most shows to say 'no pictures', but more often than not performers know they will be recorded for private use or for the YouTube. Shen Yun, however, takes it to a whole new level. A giant "Photography Strictly Prohibited" spotlight is on the curtain. We are told repeatedly that no recording or pictures are to be taken as it affects the performers and is a copyright violation. Before the curtain opened, I saw at least one Shen Yun official walk up and down the aisles, seeing to see if anyone had an errant camera out. The two songs that cut into the show: Heaven Awaits and Of Truth I Sing, are not particularly good, the latter less so because of the bass singer. 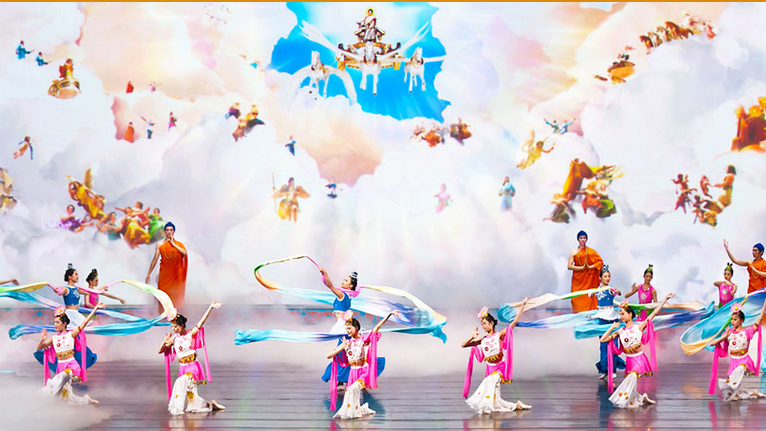 The lyrics, which are on the screen in English and Chinese as well as printed on the program, make clear that Shen Yun is not wholly divorced from a little Falun Gong/Dafa promotion. For Heaven Awaits, we hear "The Great Way of Dafa is now taught/The truth is close at hand". For Of Truth I Sing, we get even more blatant lyrics. "We fallow Dafa, the Great Way/Let not the oppression confuse/And hide the truth from view". As if to cap off some of the nuttiness, we get this bit: "Atheism and evolution are deadly ideas/Modern trends destroy what makes us human". Let me be clear: I'm not a Marxist, I'm not an atheist, and I'm not into evolution. However, I did literally cringe when I saw and heard all this because at this point I felt Shen Yun was less an innocuous dance show and more a propaganda tool. Everyone involved with Shen Yun can believe what they want, I don't care. I do care however, if I'm being played for a sucker, if I'm being sold a bill of goods and am somehow being tricked or deceived. Shen Yun does not necessarily hide its Falun Gong roots, but it does not promote them either. 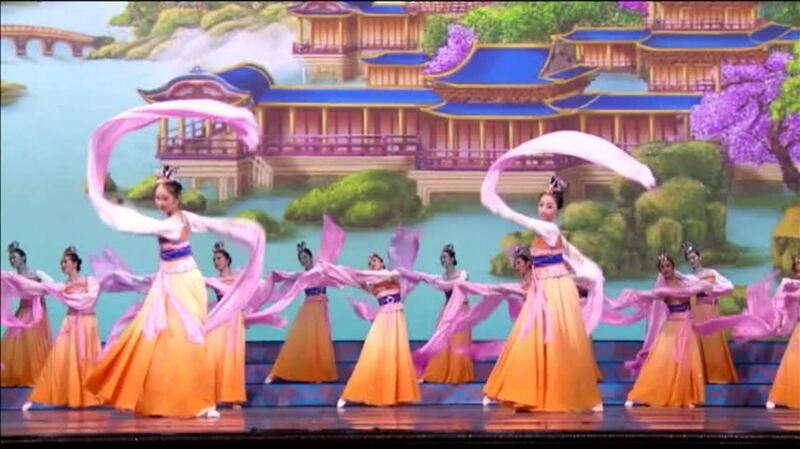 It presents itself as a celebration of Chinese music and dance, but does not tell us that everyone involved in Shen Yun is a Falun Dafa follower or that it using Shen Yun as a promotional tool. I do not think it is used to recruit new members, though I'm sure they won't object if it did. To its credit we don't have Hare Krishna-types roaming the aisles passing out their own 'little yellow books'. It, however, does use Shen Yun to bring their persecution and theology to a literal stage. Even that I might overlook if it did it without doing so in such a blatant and almost over-the-top way. Seriously, that Monty Python Karl Marx is going to haunt me for some time. There is a way of working allegory into stories while making them work on their own apart from the message behind the story. Shen Yun hasn't gotten there yet. As a show itself, I think Shen Yun has been wildly overpraised. As I said, while some dance numbers work quite well and are lovely on the whole I found something mannered in them. I found that they are very rote in how they present the dances. The songs just don't seem to fit in anywhere are are just tacked on. Worse is when the 'modern' numbers pop in: Goodness in the Face of Evil is sandwiched between the jolly Restaurant Cheer and the lusty Mongolian Spirit, the rare number to feature all men. I think Shen Yun is a one-and-done deal despite Perry's invitation to return. He may end the show with "Even if you've seen it once, you haven't seen it all", but I think I'll stay with EPCOT's version of the Middle Kingdom, no matter what Perry or Confucius says. 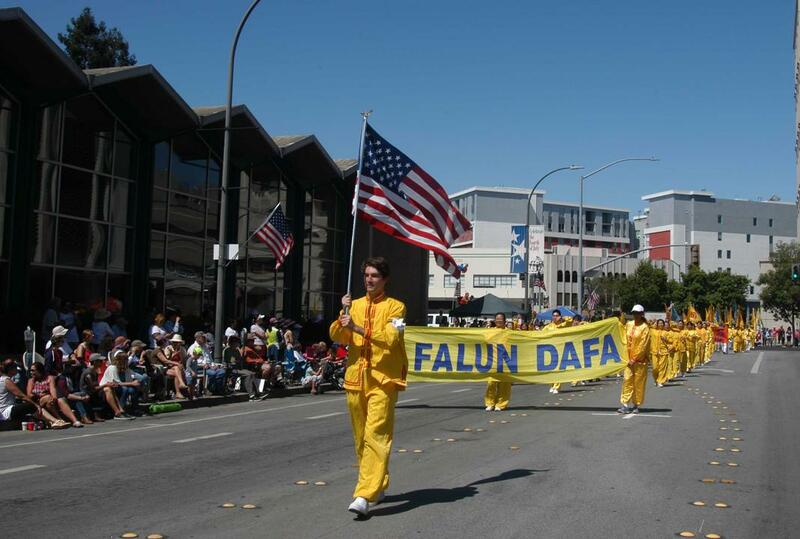 *Falun Gong and Falun Dafa are used interchangeably.